Queensland is currently ruled by a Labor Government which serves property developers, land speculators and mining companies rather than workers, the interests of whom the Labor Party was first formed to serve, or the wider community. Economically moronic or grossly ideological? Which description best fits the Cando Newman government's excuse for massive and cruel job losses and public service cuts? Here is an expose of Queensland Treasury's base and baseless rationale for austerity. Frodo still has pellets in the stomach. Condemnation from the Queensland government is rather shallow when biodiversity in southeast Queensland is under pressure from habitat loss primarily due to increased urbanisation, driven by population growth, a fact stated in the State Government’s State of the Region (SEQ) report. State planning is currently based upon the fool’s dream of endless growth. Human population growth brings disfunction, social dis-ease, lack of connection to our land and indigenous species, and increased crime. Her veterinarian carers confirm they cannot remove all the pellets from her tiny body. In a Parliamentary speech, Glen Elmes1 warned how the vast discretionary powers, given to the Minister for Infrastructure and Planning, Stirling Hinchliffe (pictured), with his past history as a property development industry insider, would add to the consequences of SEQ's already shambolic urban planning and environmental management and runaway population growth. Speech from Queensland State Parliamentary Hansard of Hansard of 12 Feb 10, linked to from Hansard page, See also: "SEQ Regional Plan a travesty against the people of South East Queensland" of 9 May 09 by Dr Jane O'Sullivan, "The downward spiral of hasty population growth" of 8 Mar 10 on Online Opinion by Dr Jane O'Sullivan. Originally published on the Queensland Greens web site on 10 Feb 09. See also: "Clive Palmer, Queensland Government announce $69 Billion Coal project" in the Sunday Mail of 7 Feb 10. 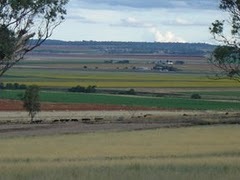 Two years after it announced its plans to ravage the fertile Felton Valley south west of Toowoomba with coal mines and coal liquefaction plants Ambre Energy has yet to secure the necessary supply of water, provide plans to capture and store carbon and provide an Environmental Impact statement. Rob McCreath of Friends of Felton has called upon the Queensland Governemnt to intervene to reject Ambre Energy's plans so that farmers can proceed with their lives without any further uncertainty. See also: "Felton farmers left in the dark" in the Toowoomba Chronicle of 12 Jan 10, "Farmers 'held hostage by mining plans'" in the Sydney Morning Herald of 11 Jan 10, "Agriculture v Mining - Friends of the Felton Valley and the Haystack Plain" on Brisbane ABC radio's Evenings with Steve Austin of 4 Jun 09, including audio files of debate (10 Mb) between John Cotter, the President of Agforce and the Chief Executive of Queensland Resources, Michael Roche and interview (10Mb) with Rob McCreath of Friends of Felton, "Farmers occupy Qld Premier's office to save Darling Downs from coal mining" of 2 Nov 08, "Rural town threatened by open cut coal-mine: Acland, Queensland" of 10 Jan 10, Friends of Felton web site at www.fof.org.au and blog site at www.friendsoffelton.blogspot.com. The Queensland Government and the Brisbane City Council plan to allow developers to turn Queensland's historic Yungaba immigration hostel into yet another luxury gated residential housing development against the overwhelming objections of local residents. Protest against this planned cultural vandalism on the grass on the river side of Yungaba at 10am-12.30pm Sun 13 December. Update, 30 Jan 10: Although Yungaba has been sold undemocratically to Australand, it's not over. Delene Cuddihy writes of our prospects. What else you can do: Sign the e-petition which calls for the immediate resignation of the Queensland Govenment and new elections on the grounds of not consulting public on privatisation. See also: www.yungaba.org.au, "Yungaba's is a history that should not be lost" by Australian author David Malouf in the Australian of 5 Dec 09, "Ghost of Cloudland back with a vengeance" by Rosemary Sorensen in the Australian of 5 Dec 09, "Govt rejects tag of 'red-neck developer'" by Tony Moore in the Brisbane Times of 5 Dec 09. The Queensland Government's Draft South East Queensland Regional Plan, far from achieving its lofty claimed goals of "protect(ing) and enhanc(ing) the quality of life", landscape values, biodiversity and natural assets of the region, will, instead, turn much of that region into an economically depressed, crowded and ecologically unsustainable slum for no better purpose than to keep profits flowing into the pockets of developers who largely bankroll the ruling Queensland Labor Party. At a summit to save the Great Barrier Reef on 24 October, Premier Anna Bligh asked the public how to improve the sediment-laden water that threatens to choke the Reef. She still plans to triple Queensland's record export rate of climate-changing coal by 2030, and ignores Greens MP Ronan Lee's advice to restore water monitoring programs axed by her Government in 1999. See also: "Queensland Government cracks down on farmers near Barrier Reef" on the ABC of 27 Oct 08, "Qld may regulate farms to save Reef" in SMH of 24 Oct 08, "Great Barrier Reef summit today" in The Australian of 24 Oct 08. Trevor Rowe is chairperson of the Queensland Investment Corporation, a state-owned corporation that invests the super of Queensland public servants. He is now also the chair of BrisConnections, a private consortium that has been given the contract to build the Queensland Government and Brisbane City Council's Airport Link car tunnel. So were is the superannuation of State government employees going, and what will be the most important urban transport investments in a future market that will be forced to acknowledge resource scarcity and the need for energy efficient transport? Queensland Labor Premier Anna Bligh, in a letter published in the Courier Mail on 8 August, claimed concern at the decline in South East Queensland's koala population. However, it was her Government which only recently legislated, against community and local council objections, to fast-track the destruction of much of the remaining koala habitats in South East Queensland to make way for residential development. What you can do: Email Premier Anna Bligh (premier [AT] ministerial qld gov au) and Deputy Premier Paul Lucas (deputypremier [AT] ministerial. qld. gov. au) to demand that they act now to end Queensland's economic dependency upon population growth, which threatens the koala and other native species, including the lungfish, with extinction. See also: Locals join koala 'crisis' taskforce in the Bayside Bulletin of 7 Aug 08 including readers' comments. Coming up: Fund-raising river cruise stopping at Yungaba on August 23rd. What you can do: Nominate Yungaba as a site worth retaining. What will disaffiliation from the Labor Party achieve for the ETU? The Electrical Trade Union's threat to disaffiliate from the Labor Party in protest at its treatment by the Queensland and Federal Labor Government begs the question of how trade unions can ever hope to be adequately represented in Parliament. See also: QLD Labor stung by protests, poll in the Brisbane Times of 21 June 08. Read more about What will disaffiliation from the Labor Party achieve for the ETU? A rally to protest about the costs of growth to the community and the invasion of housing and infrastructure into high biodiversity areas of South East Queensland will take place outside the Labor Party Conference at the Convention Centre on the Gold Coast this Saturday, 21st June at 10:30am. At the elections of 15 March pro-developer councils were trounced in Redland City and on the Sunshine Coast, but this popular rejection of over-development means little to the State Labor Government of Anna Bligh and the property developers she serves. See also: More chickens of population growth come home to roost in Queensland of 14 May 08, How to end the Queensland economy's addiction to population growth? of 26 Apr 08, Courier-Mail beats up on public for complaining about cost of 'progress' of 14 Apr 08, The Australian laments outcome of Queensland local government elections of 30 Mar 08. Although over 90% of the world’s sharks, vital for the ecological integrity of marine eco-systems, have already been eradicated, the Queensland government plans to issue licenses for the finning of an unlimited number of sharks from the Great Barrier Reef. Original media release from the Sea Shepherd Conservation Society of 16 May 08. See also: Greens call for protection of shark stocks of 4 Jun 08. How to end the Queensland economy's addiction to population growth? Mayor Bob Abbot's plans to cap Sunshine Coast population: applauded by residents; opposed by developers, Murdoch newsmedia, Queensland State Government. Read more about How to end the Queensland economy's addiction to population growth? Queensland's Premier Anna Bligh, Deputy Premier Paul Lucas and the developer Multiplex have all declined an opportunity to convince the Brisbane public of the merits of their plans to cover the northern third of the Brisbane River adjoining the CBD with a high-rise residential apartment complex. Cate Molloy today pledged that if elected she would urge, if not demand, that the new Sunshine Coast Super Council adopt Adelaide City Council's new totally solar powered electronic bus system. Queensland Premier Anna Bligh acts out of character in order to save one of the few remaining icons of Queensland's history in Brisbane's CBD. Once a proponent of water fluoridation, Dr Doug Everingham, who served as Federal Health Minister in the Whitlam Labor Goverenment from 1972 until 1975, argues against the Queensland Government's plans to force Queenslanders to drink fluoridated water. See also Qld Health staff doctored tooth decay data used in decision to force fluoridation, comment, NO CHOICE? ... WHY is mass medication mandated.. WHY?, of 6 Oct 2012 by jay mark. A delegation to the Queensland Premier, Health Minister and Chief Health Officer on the 12th February made them aware that Queensland Health staff have doctored tooth decay rates data used in the decision making process, however it appears that this is being ignored and that Legislation based on fraudulent data will be rammed through Parliament on Tuesday 26th February. Independent Candidate for Wide Bay Cate Molloy vows to introduce bills to stop the Traveston Dam and forced council amalgamations. Environmental laws don’t apply to mines is the message from Premier Bligh’s promise to pass special laws to override yesterday’s Court decision against Xstrata Coal, said the Greens today. Australian Greens lead Senate candidate for Queensland Larissa Waters will today meet Douglas Shire Council Mayor Mike Berwick to discuss how the Greens can help to overturn the decision to amalgamate local Councils. The Coalition Government has exposed its hypocrisy on council amalgamations with its current attack on the Queensland Government according to Independent Member for Calare, Peter Andren. Queensland Premier Peter Beattie and his Local Government Minister Andrew Fraser have forgotten the meaning of the word 'democracy'. Mayors who consult with their own constituents over the question of the abolition of their local governments face instant dismissal. These provisions were added to the legislation which forces many Queensland local councils to amalgamate with neighbouring councils at the last minute when the legislation was rushed through in the early hours of Friday 10 August. Those who have read "The Latham Diaries" will have found startling confirmation of the fact the State Labor Premiers are cynical enough to deliberately damage the electoral prospects of their Federal counterparts in order to better ensure their own survival at the state level.Adapted from an article cross-posted to Online Opinion. Also, see article on webdiary "Peter Beattie bent on destruction of Rudd's chances" by Margo Kingston.